Decision-makers remain tight-lipped about whether ratepayers will need to open their wallets in order to lure domestic Jetstar services to Hamilton International Airport. Hamilton is in the ring with six other cities in a move Jetstar has announced that will see it fly to regional destinations from December. However when asked whether the city would need to put money into the service, head of New Zealand Jetstar, Grant Kerr, simply said partnerships were being discussed. "From Jetstar's perspective costs obviously are a key point for us, so it's how we can create a relationship and a partnership - so what does that really look like? So that's what we're discussing today as well." While the city will have to wait until September to learn if Jetstar will service Hamilton, Jetstar leaders met with city leaders on Monday to talk business. Kerr said, for the city to secure the service, it must convince Jetstar that Hamilton had sufficient growth and demand. "The key reason to come to Hamilton for Jetstar would be to bring growth, so bringing the opportunity for people to travel more frequently at lower cost." The money question was also side-stepped by Kiri Goulter, chief executive of Hamilton Waikato Tourism, who said it would be "fabulous to have a partnership of some sort" with Jetstar. HWT recently secured an extra $405,000 from seven council funding partners. "The focus of the additional funding is to grow our domestic market, so connectivity, and airline activity will play a part in that. Secondly it's to grow the business and events sector, so once again connectivity, capacity will play a part in helping to support that. Hamilton Mayor Julie Hardaker said she felt the city had sufficient growth to make domestic routes viable for the airline, with a growing tourism market and strong business sector. "Jetstar is telling us what they're looking for is growth and consumer demand ... and I think we can put that case together pretty well. "If we get Jetstar across the line, that would be a good outcome for not only business visitors, but mums,dads and students travelling around the country." The rate-payer owned airport still retains the word International in its name despite the fact no carriers leave our shores from its terminal. In recent years, Jetstar has operated flights to Australia from Hamilton, but Kerr said the prospect of international flights returning to the city airport is unlikely. "At this point I don't see an opportunity for an international travel [service]." Hardaker said the city needed to focus on being a strong regional airport. "We've had carriers come and go through the international market and what it demonstrates is long-term sustainability of international carriers is very difficult. "You've got the choice of international options out of Auckland, but if Jetstar come in, one thing they've also talked to us about is the connection with Qantas." 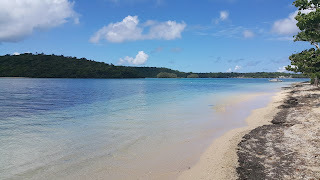 I am in Tonga again and have snapped a few PICs for you. I have seen both J32s SKY and SAM. Also the Y12 has been coming and going. Both J32s have been operating TBU - VAV - TBU almost non-stop everyday expect Sundays. 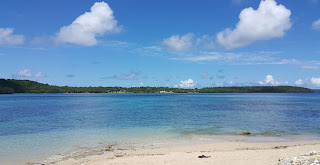 The MA60 made a show yesterday while waiting for our flight to Vava'u. It was not flying but out having a maintenance ground run. The "new" Royal Tongan Airlines crew did have the MA60 up last week for one circuit. Air Chathams chief executive Craig Emeny says understanding the Whakatane market has enabled the company to provide a quality service. 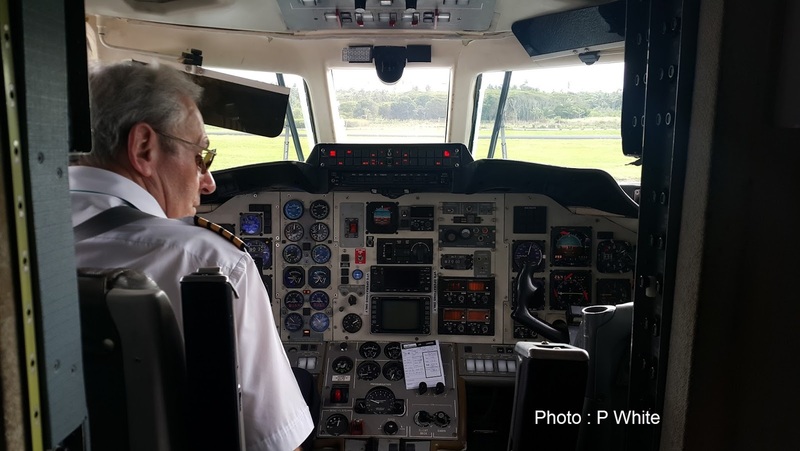 It's been six weeks since Air Chathams took over after Air New Zealand stopped flights between Whakatane and Auckland and things are going well enough to add another daily flight to the schedule. However, the company, along with the three mayors of the Eastern Bay, are continuing discussions with Air New Zealand to ensure the success continues. Whakatane mayor Tony Bonne said a recent report into the economic benefits of flights into Whakatane showed an addition of $17 million to the local economy. "Reports were completed for the three regions Air New Zealand recently stopped servicing [Westport and Kaitaia as well as Whakatane] and will be shown to the Prime Minister to highlight the economic importance of each having a visible presence with our national carrier," Mr Bonne said. Two proposals had been put to Air New Zealand from the Eastern Bay. "Right now we have lost all visibility through Air New Zealand and its website," Mr Bonne said. "Were asking for Whakatane to be included online by highlighting flights to the region through Air Chathams and hoping people will be able to book flights with Air Chathams through the Air New Zealand website. "Some of the bigger companies only use Air New Zealand and have been booking staff flights to Tauranga and Rotorua then hiring cars to get people to Whakatane. "If they don't agree to making bookings available then we would at least like the inclusion." He said Air New Zealand had not said "no" but were putting up obstacles toward making it happen. 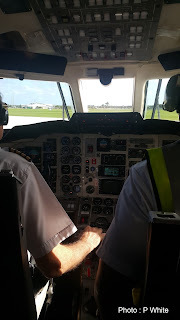 Mr Bonne, who flew Air Chathams on Wednesday, said a company chief executive sitting in the seat behind him gave the service a 10 out of 10. 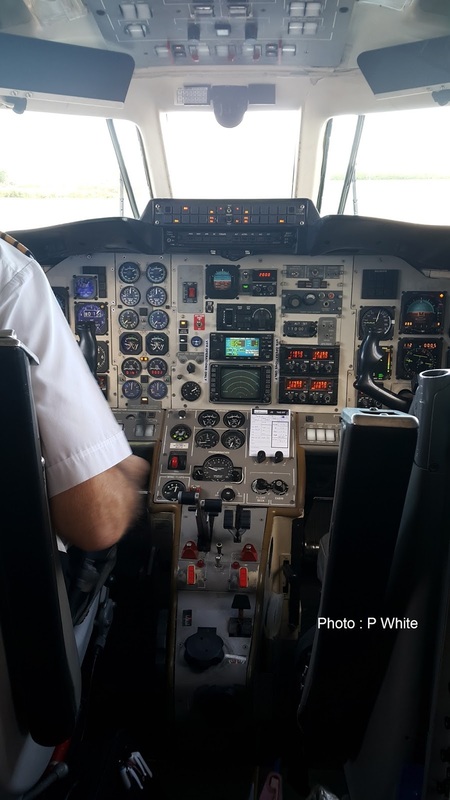 "Everything I have heard to date has been positive and I urge local people and businesses to not only fly Air Chathams, but also to ensure they tell everybody about the service." Mr Emeny said it was always great to receive such feedback. "The past six weeks have allowed us to see if what we had planned was right and make any adjustments we believe needed making." Air Chathams have an 18-seater and a 50-seater available for the flights. "So far the smaller plane has been used the majority of the time although there has been the odd day when demand has meant we've used the bigger one. We expect demand to increase during summer." Air Chathams is looking to change arrival and departure times, making the morning flight to Auckland slightly earlier and the return trip to Whakatane slightly later. "In addition, we will be adding an 11am flight to Auckland to accommodate people who are not so business orientated. This will be more about meeting international flights or connecting with other flights." Mr Emeny was quick with praise for staff working at the airport. Air Chathams staff were enjoying Whakatane and becoming familiar faces at cafes and restaurants in town. Next up will be a passenger survey to see if the public agrees Air Chathams is doing it right. What an amazing couple of weeks it has been in third level scene. 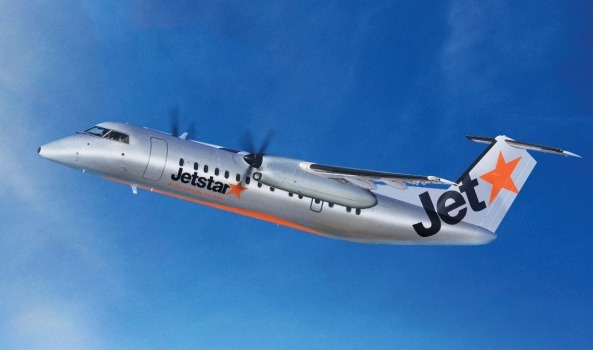 First Jetstar have announced their intention to move into the regional market. Kiwi Regional have announced their start date and first routes. And finally newcomer Originair have been the shock news with the announcement of their intention to start services from Nelson. Rumours that Jetstar were coming to enter the regional market have been around for years. The announcement that these will be operated with 50 seat Bombardier Q300s indicates a couple of things... they are using spare Qantas capacity and given the size of the aircraft it is unlikely there will be a huge number of cheap seats. Nonetheless I expect there will be some form of air war. It will be interesting to see what four ports they choose. Of more interest to me are the other two announcements. Ewan Wilson's Kiwi Regional has announced a twice daily Dunedin to Queenstown return service morning and evening with a Dunedin-Nelson-Hamilton return service in the middle of the day. While I think the Dunedin-Nelson-Hamilton service might generate some traffic the Dunedin-Queenstown service is just nuts without the cola. Going back to Southern Scenic Airways many have tried connecting the two centres and failed. I suspect this particular route won't last long. And Ewan Wilson must be slightly peeved about Robert Inglis' plans for Originair especially operating on the Nelson-Palmerston North route. Robert Inglis has a lot of experience but taking on Air New Zealand head to head on the Nelson-Wellington route is either brave or stupid. I think I would have focused on the Nelson-Palmerston North service which was apparently doing very well. Two return weekday flights that are too late for morning business flights and too early for evening business flights won't be real winners in my opinion. If Jetstar goes Wellington Nelson one wonders what Originair' future will be. 2015 is certainly been a real year for third level airlines. As in the past with third level airlines time will tell who or what will survive. Freightways' subsidiary, Fieldair Holdings Limited, will form a Joint Venture company with Airwork Holdings Limited that will operate three Boeing 737-400 freighter aircraft to replace the airfreight service currently performed by Fieldair’s subsidiary, Air Freight NZ Limited, which uses five Convair freighter aircraft. Airwork will lease the three 737-400 freighter aircraft to the joint enture company. The joint venture company will operate the aircraft. Customers of the joint venture company will be Freightways' express package businesses and NZ Post’s Express Couriers Limited business. If demand warrants it, capacity will be made available to other freight operators. The 737-400 freighter aircraft will provide sufficient capacity to accommodate the expected future growth of Freightways’ express package volumes. Freightways' existing Convair fleet will be made available for sale upon the transition to the 737-400 freighter aircraft. The carrying value of Freightways’ Convair fleet and related spare parts has been written down by $7.6 million to reflect the realisable US dollar (USD) value of the fleet and parts at the current USD foreign exchange rate. The carrying value of the Convair fleet had previously been based on the exchange rate applicable at the time the last Convair was purchased in 2003 and supported by the fleet’s value in use to Freightways. The decision to transition from and sell the Convair fleet triggered the need to assess realisable values for accounting purposes and to reflect those values at the prevailing exchange rate. As a non-recurring and non-cash expense this write-down in value will not impact on Freightways' dividend payments to its shareholders. To transition to the new airfreight service, including redelivery of a currently-leased aircraft, capital expenditure of $1.7 million and transition costs of $1.35 million will be incurred. The financial benefit to Freightways is primarily related to cash savings in capital expenditure of approximately $3 million per annum and incremental savings in annual operating costs. Freightways' express package businesses provide an overnight, inter-island airfreight service to their customers. To enable this service, Freightways operates its own dedicated airfreight service from airport/road hubs at Auckland, Palmerston North and Christchurch. Freightways' aircraft fleet consists of 4 owned Convair CV580 aircraft and 1 leased Convair CV5800 aircraft. The Convair fleet has provided a good and reliable service since its introduction into New Zealand in 1989. As express package volumes have grown, demand for the earlier positioning of airfreight through the airport hubs has increased. In order to sustain the levels of service required by its customers, Freightways has for some time been exploring alternative aircraft options. The 737-400 aircraft are deemed by Freightways to be the most suitable alternative aircraft to the current Convair fleet. The 737-400 aircraft operate with a net payload of approximately 17,000kg compared to a typical Convair CV580 net payload of 6,500kg. The 737-400’s will provide sufficient capacity for the future expected growth of the overnight airfreight market in New Zealand for many years to come. The 737-400’s are fitted with modern avionics equipment that is compliant with Airways Corporation requirements for navigation equipment used throughout New Zealand and will be for the foreseeable future. Additionally, carbon emissions per item of freight carried compared to the current use of the Convair fleet are expected to reduce. Fieldair Holdings has operated in New Zealand’s general aviation and engineering maintenance market since 1951 and since 1989 as an airfreight operator for Freightways. Fieldair will continue to service its other maintenance and flight operations customers from its bases in Palmerston North, Auckland, Christchurch and Wellington, while also participating in the joint venture company. Airwork is an experienced operator of Boeing 737 aircraft and has recently purchased a number of 737-400 passenger aircraft that will be converted to freighters in the United States. A joint venture that matches Fieldair’s and Airwork’s respective aviation expertise pragmatically aligns the capability of each business. This new airfreight service will deliver positive service and financial benefits to Freightway’s stakeholders. A new combined airfreight network created by NZ Post subsidiary Express Couriers Limited (ECL) and Freightways will utilise three Airwork-owned Boeing 737-400F aircraft. The aircraft, which will travel between Auckland, Palmerston North and Christchurch, will be leased to a new entity operated jointly by Airwork and Freightways subsidiary Fieldair. Airwork will enter into a long-term (10 year) contract with the Joint Venture, which will ensure Airwork remains a key player in the new ECL-Freightways network. Airwork has successfully operated the ECL and New Zealand Post aircraft for more than 20 years and brings extensive experience and capability in operating and maintaining Boeing 737s to the new Joint Venture. Airwork CEO Chris Hart says the new agreement will help to future proof the express freight network in New Zealand while ensuring its major customers avoided an otherwise significant cost increase. Airwork earlier this month announced it had extended its contract with Toll Holdings’ Australian airfreight express business to 2022 and would be replacing at least two of its 737-300Fs on that contract with 737-400Fs, the first two aircraft to be replaced before February 2016. Hart says Airwork remains on course to record net profit after tax of $15.3 million for the year ending 30 June 2015. And this from www.stuff.co.nz indicating the departure of the Friendships. One wonders what will happen with the Metros? The rapid growth in online shopping has prompted express delivery company Freightways and New Zealand Post to upgrade their fleets of propeller freighter aircraft to Boeing 737-400 jets. New Zealand Post and Freightways' subsidiary Fieldair will lease the the 737-400s from Airwork which would also operate the aircraft. The 737s will replace Fieldair's existing fleet of ageing five Convair CV580 turboprop freighters as well as New Zealand Post's 737-300 and two Fokker F27 Friendships. The 737 passengers planes will be converted to freighters in the United States and will be progressively pressed into service by May next year. The bigger 737 will carry a payload of 17 tonnes compared to a typical Convair's 6.5 tonne capacity. The aircraft will fly between Auckland, Palmerston North and Christchurch. Nelson skies will become more crowded as a sixth airline, Originair, is set to take off. Originair - established by Robert Inglis who founded Air Nelson then ran Origin Pacific Airways which collapsed in 2006 - will fly Nelson-Wellington and Nelson-Palmerston North. His move comes as Qantas-owned Jetstar's roadshow is in Nelson on Thursday as it presses ahead with plans to start regional flights from December. Nelson is one of the seven regional centres it is considering operating from. It will choose at least four. The Jetstar regional fares will go on sale in September. Kiwi Regional Airlines announced on Wednesday that it will start on September 27, flying direct between Nelson and Hamilton, and Nelson and Dunedin, as well as between Dunedin and Queenstown. The newcomers will join Air New Zealand as well as smaller airlines Sounds Air and air2there which service Nelson. Originair will pick up the Nelson to Palmerston North direct route that Air NZ dumped in April. Kiwi Regional had intended to fly that route but instead will fly direct Nelson to Hamilton. Originair's head office has opened this week in Achilles Ave in central Nelson and the airline will employ up to 20 staff in Nelson and Palmerston North by take-off. Inglis owns Inglis Aircraft Ltd and the new Originair fleet will consist of two 19-seat Jetstreams, one of which had been leased to Vincent Aviation then LifeFlight. Inglis described its move as ``modest". "This isn't Ben Hur, it's a very small operation," he said. "We own the eqipment, we're not exposed to a lot of risk with exchange rates, we have operated this route and know it well. Hopefully we're just offering Nelson people another choice." Originair's standard fares for Nelson-Wellington would go from $129 through a range to $257 for a flexi fully refundable fare, and for Nelson Palmerston North from $169 to $289. Specials would be offered from time to time, he said. The Nelson-Palmerston North and Nelson-Wellington routes were a return to the service he and Nicki Smith first started in the 1980s, and this was an 80/20 venture between them. "As a small regional airline we are really pleased to be able to offer the direct flights that the Nelson and Manawatu regions have said they need and appreciate," said Inglis. "We are also pleased to offer travellers to and from Wellington more peak-time flights to the capital. "We are experienced airline operators and have the aircraft and systems to service these routes," he said. "We have been working hard since December to be ready to fly between Nelson and Palmerston North by August 12. "Our twin-turbo prop pressurised 19-seater planes, operated with a two pilot crew, are the right gauge for these links and are aircraft that regional passengers are used to flying in. Because of this, we believe the transition to our service from Air New Zealand's former service will be easy for people." Inglis did not see the arrival of Jetstar to the region as an issue. "I imagine they are interested in the core routes from Nelson and provincial airports to the Auckland gateway. I'm quite sure they are not interested in Nelson-Palmerston North." He saw Kiwi Regional Airlines as focusing on the tourist market, and said he did not have a relationship with its chief executive Ewan Wilson. Nelson Airport is in the process of planning the redevelopment of its terminal, and chief excutive Rob Evans said the establishment of a new airline was another great news story for Nelson. "Having Originair here will be fantastic for Nelson by offering more availability for inbound and outbound passengers on a direct route to Palmerston North supporting both business and leisure travellers," Evans said. "There are some great synergies between both catchment regions to really take advantage of what's on offer. More choice for travellers to Wellington will also be welcomed by Nelsonians. "Robert Inglis is a true aviation entrepreneur with wonderful vision and dedication in a very volatile industry," he said. Nelson Region Economic Development Agency chief executive Bill Findlater said he supported the addition of a new regional airline for Nelson. "Gaining back the direct regional Nelson to Palmerston North route gives Nelsonians an important link to central North Island. Any initiative that provides more regional services for Nelson has to be a good thing." Nelson mayor Rachel Reese also welcomed OriginAir flying to and from Nelson. "We already have significant interest from both the business and tourism sectors for new routes and extended services. Any new airline will only help increase capacity and opportunity for people to come to our beautiful city. "We look forward to working with Robert and the OriginAir team to support the long term growth of travellers to our region." Originair will not directly employ the flight crew. Inglis said that due to the relatively small scale of the proposed operation he had collaborated with two companies from the Freightways Ltd Group, Air Freight NZ Ltd (Air Freight) and Fieldair Engineering Ltd (Fieldair), to carry out flight operations and fleet maintenance respectively. Both Air Freight and Fieldair had decades of relevant aviation experience and would provide the airline with a high quality service and allow Originair's core team to focus on its marketing and customer service, he said. "Our website and reservation system is already live so people can book their flights today at www.Originair.nz," Inglis said. 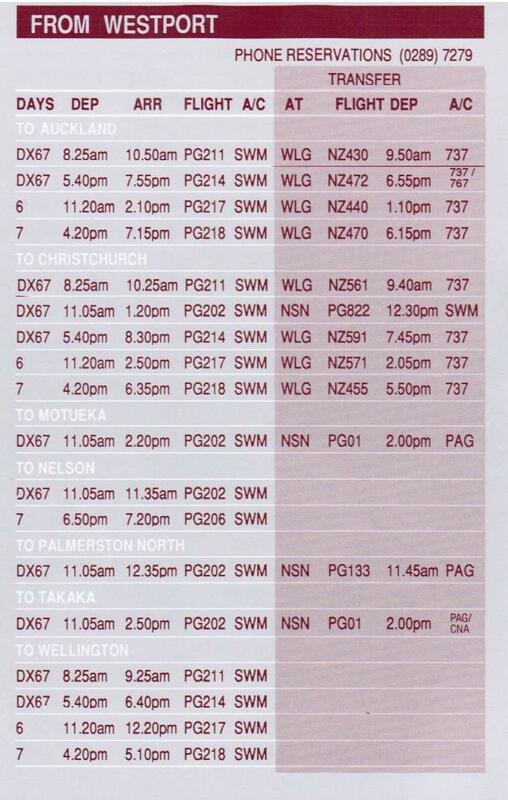 Kiwi Regional: starts September 27 but not to Wellington. Robert Inglis started Air Nelson in 1979 with Nicki Smith. Air New Zealand purchased 50 per cent of the airline in 1988, then the total shareholding in 1996 and still operates it today. Inglis and Smith then went on to start Origin Pacific Airways in 1996 as a feeder airline for Qantas. It went into liquidation in 2006 after Qantas' Jet Connect cancelled a contract that resulted in Origin losing 60 per cent of its business. Now Nelson-based Inglis is a director of Inglis Aircraft Ltd and the owner of Northwood Hop Co and Northwood Wines. 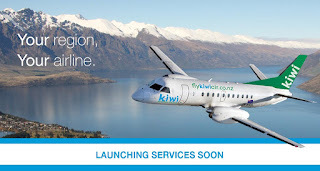 New air service Kiwi Regional Airlines has announced the routes it will fly with its first aircraft and a start date. It will run its first passenger service on September 27, and each day will start with a return Dunedin-Queenstown flight, says its chief executive, Ewan Wilson. The aircraft, a SAAB 340A 32-seat twin-engine turboprop model, will then fly mid-morning to Nelson direct from Dunedin, a route that has not been flown previously by a scheduled service, but which it says connects the country's premier fishing industry ports, and the two largest South Island cities outside Christchurch. Kiwi Regional Airlines has announced the first four routes it will operate daily, from September 27. From Nelson, Kiwi will fly return to Hamilton in the middle of the day. It says this refreshes a connection flown by thousands of passengers annually on both Origin Pacific and Air New Zealand until 2008. The former, however, used 19-seater planes, Wilson said. "We believe with us operating it in better-fit aircraft, it's a very economical way of capturing the market." The flight then returns from Nelson to Dunedin mid-afternoon, before repeating the Dunedin-Queenstown return flight in the early evening. Wilson said he was "very pleased at the progress Kiwi is making". "Our Civil Aviation Authority certification is well under way, key personnel have been appointed, airports are being negotiated with, aircraft purchase steps are nearing fruition and now we have finalised our first route. "Our route is an exciting one, different from all other airlines, and we expect will be well-supported by the communities it serves." Kiwi intends to add a second aircraft, and additional routes, within the next 12 months, he said. Kiwi produced a draft flight route proposal in February that suggested an Auckland-Hamilton link was on the cards, but Wilson has said Kiwi won't compete with Jetstar and Air NZ. "Air NZ continues to service Auckland [from Hamilton] until early next year, our position may change once they have departed the scene, but we're taking a very conservative approach." Jetstar made the announcement in Auckland today with Prime Minister and tourism minister John Key. The airline said its new flights - due to start in December - would bring "low fares competition to monopoly domestic routes around the country." 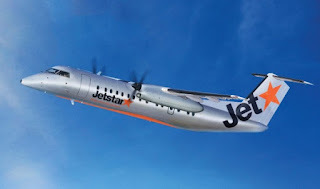 Jeststar is owned by Qantas whose chief executive Alan Joyce said the time was right to bring Jetstar's fares to the regions. "When Jetstar brought low fares to New Zealand's key routes six years ago it completely transformed the market in terms of value and now we'll do the same for regional New Zealand," he said. There had been calls for more choice and lower fares on regional routes," Joyce said. "We're answering that call by launching Jetstar flights to regional New Zealand, making air travel more affordable for people who live outside the main centres and boosting tourism and the economies of these areas." The new regional destinations would connect to the broader Qantas Group network, including both Qantas and Jetstar flying across the Tasman. The owners of air service sunair say their new service in Whakatane is going well. Owner and operator Bev Power says the service has been well received by the Eastern Bay public and the services to Napier, Gisborne and Hamilton are frequently used. She says flights to Napier are more expensive than the other two destinations as the route to Hawkes Bay is longer and slightly more expensive to run their planes. When asked if Sunair was thinking of extending their services to other parts of the country, Bev Power says it's definitely a possibility. She says we're always looking at other oppurtunies, so we would want to improve service to other regions, not really main regions. Sounds Air launched their Paraparaumu-Nelson air service on Monday 15 June 2015 with the first service to Nelson (SDA501) and the return flight from Nelson (SDA502) being flown by Tim Johnson in Cessna 208B Grand Caravan ZK-SAY. Sounds Air are operating two return flights each weekday between the two centres as well as a return flight on Sundays. Tonga’s sole domestic carrier has brought in a new 19-seater BAe Jetstream-32 aircraft from New Zealand which began servicing Vava’u on Saturday, 6 June. 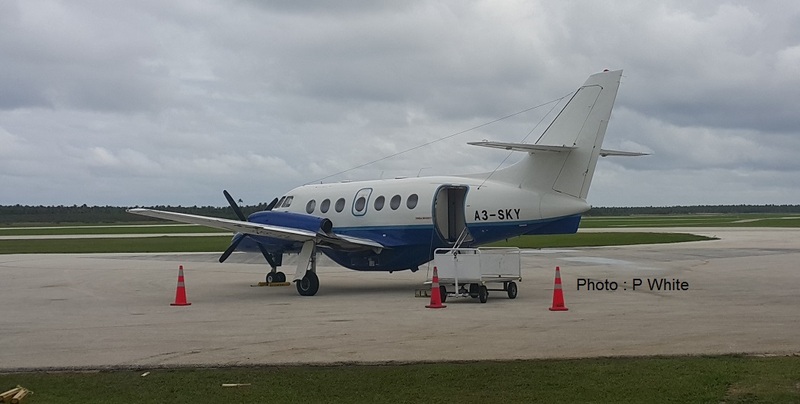 Real Tonga Airline CEO Tevita Palu said the arrival of its second Jetstream aircraft now provides additional capacity for the peak season. He said they will also provide more daily services to increase the options available to travellers. “Our team have completed all regulatory requirements for the aircraft in New Zealand, including de-registration. 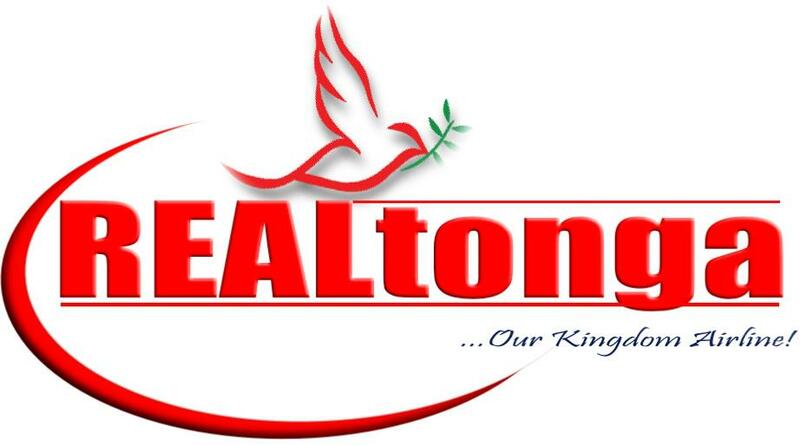 The aircraft has been registered in Tonga and has been issued a Certificate of Airworthiness, which allowed it to start service immediately,” he said. Tevita said the Jetstream had undergone major maintenance in New Zealand, including the installation of additional equipment that offers the aircraft regional capability. On 4 June, the aircraft was flown into Tonga by the airline’s flight operations manager, Captain Anthony Halliwell and RT First Officer, Athol Isaac. Real Tonga now has three small aircraft, including a Jetstream and Y12. The airline has partnered with Fiji Airways flying its 68-seater aircraft between Tongatapu and Vava’u. Tongan registered BAe 32 Jetstream A3-SKY at Auckland on a refuelling stop on 3 June 2015. The Jetstream flew to Tonga via Norfolk Island and Noumea. Further talks are planned this month between Air Chathams and Air New Zealand over an inter-line agreement. The national carrier has continued to resist approaches for an arrangement with the new operator to enable passengers to book from Whakatane to other destinations beyond Auckland, in both directions. Air Chathams Chief Executive Craig Emeny says he re-opened the process with Air New Zealand last month, and formal talks are set down for early this month. He says it's not just for Air Chathams' convenience. He says where it is important is to ensure that the Eastern Bay of Plenty is kept on the map, and not bypassed. He says it's important people have information on getting into Whakatane. It's all about visibility. Westport first came on Air Nelson's radar in July 1988 when independently owned Air Nelson and Hamilton-based Eagle Air sought to link their services. 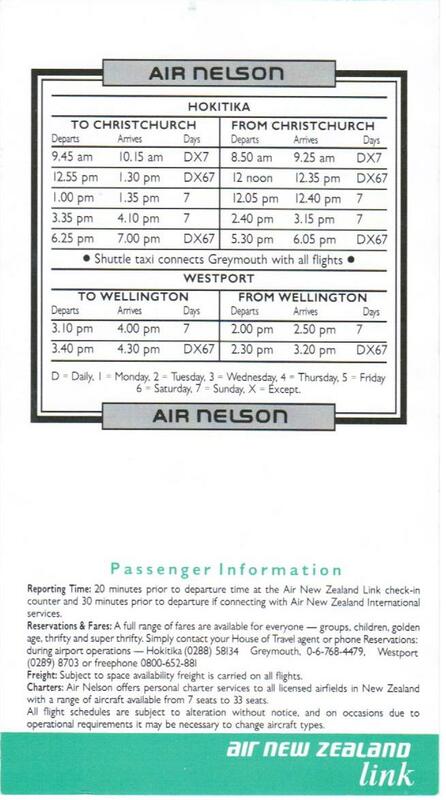 The proposed Air Nelson service from Nelson to Westport and Greymouth was scheduled to commence on the 1st of November 1988. 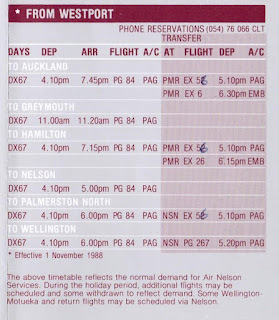 Connections were to made at Nelson to Air Nelson's services to Wellington and Palmerston North where there would be connections to Eagle Air flights throughout the central North Island. The planned service, which was to use a seven-seater Piper Navajo envisaged having a morning service northbound and returning along the same route in the afternoon. This service, however, never eventuated as on the 31st of August 1988 Air New Zealand announced that it had bought Eagle Air and a 50% stake in Air Nelson and that as part of this Air Nelson were to operate services to Westport using a Fairchild Metroliner on behalf of Air New Zealand. 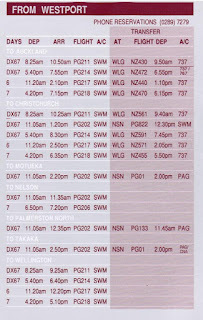 The service that never got airborne... the Westport schedule for the Nelson-Westport-Greymouth service. 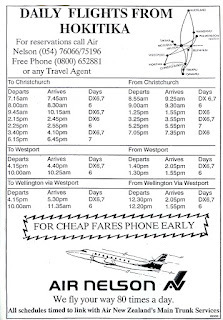 Air New Zealand and Air Nelson obviously had high hopes for the new Metroliner service to Westport with two flights to Wellington scheduled each weekday along with a flight to Nelson. In the weekends a flight was scheduled each day. Air Nelson commenced its services to Westport on the 31st of October 1988. 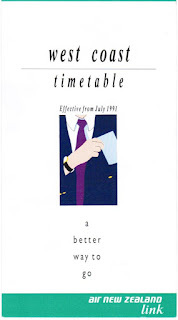 Delays in introducing the Metroliners meant Air Nelson had to charter a variety of aircraft to introduce its services. After only three weeks of operating into Westport Air Nelson's managing director Robert Inglis said patronage had been less encouraging on the Wellington-Westport run with chartered Friendships leaving most days with "sevens and eights." Plans to introduce a Metroliner II on to that route are now being revised because the company which owns the aircraft have not been able to get it up to a maintenance standard that Air Nelson is comfortable with, he said. "Therefore, we are currently revisiting the question of what type of aircraft we will operate to Westport." On the 1st of April 1989 Air Nelson brought a second Metroliner, ZK-NSV, into service. 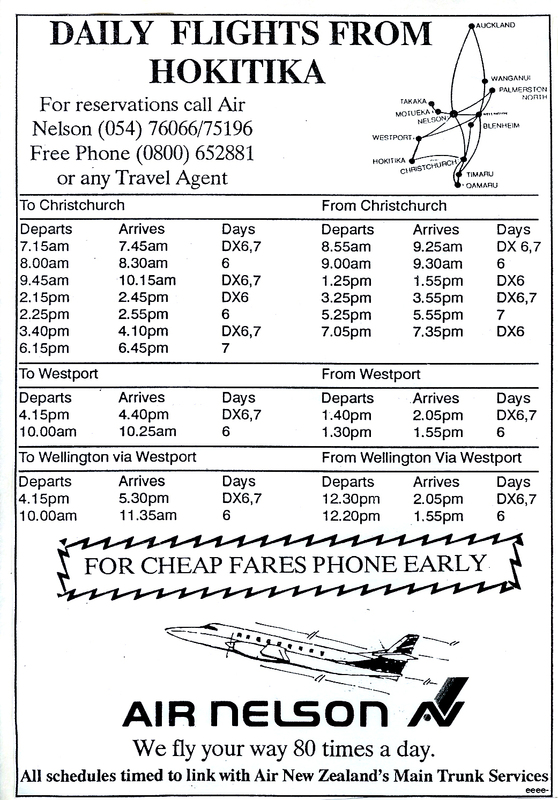 At this time Air Nelson introduced two weekday Metroliner services from Westport to Wellington, one operating via Nelson and the other direct. On Saturdays a Piper Navajo or Chieftain operated a single service into Westport from Nelson while on Sunday a Metroliner service was operated direct from Wellington. The new look of Air New Zealand's service to Westport - 18-seat Fairchild Metroliner III ZK-NSW at Westport on 15 August 1990. The Westport service continued to perform poorly and flight reductions on the morning began from July 1989. The company cited widely fluctuating passenger numbers and the Westport Airport Authority's refusal to lower landing charges as the reason. Air Nelson's marketing manager, Mr Noel Gillespie, said "We would very much like to have two flights a day but we have had substantial losses on the morning Metroliner flights to Westport." By the 1st of November 1989 Westport was receiving a single Air Nelson flight each day. Despite the struggle with the Wellington service Westport interests were keen for the reinstatement of a service to Christchurch. 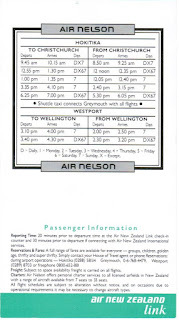 Air Nelson finally agreed to trial service and from the 6th of August 1990 it added a Mondays through Saturday service from Westport to Christchurch via Hokitika that was reminiscent of the NAC and Air New Zealand Friendship service. As with the Friendships services the flights were poorly timed with both flights operating through Westport in the afternoon. 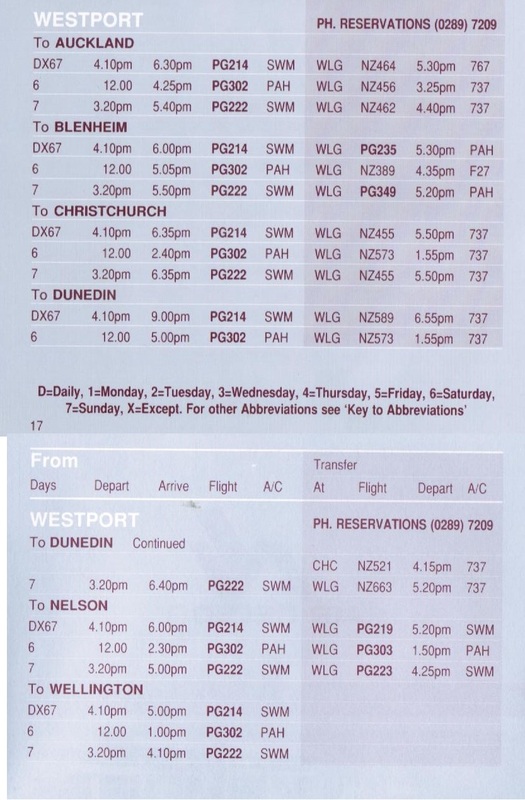 On Sundays a single return flight was operated from Wellington to Westport and return. 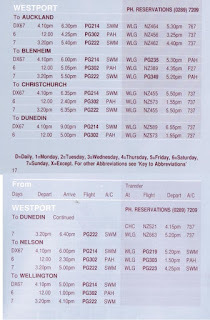 The Christchurch flights were short lived and from 9 February 1991 the schedule was reduced to a daily flight on the Wellington-Westport-Wellington route. Noel Gillespie said they had implemented the trial after lobbying from Westport people. However, there were usually only 2 or 3 passengers from Westport on the flight, sometimes none at all. "We have to do what is economic for Air Nelson and the service just hasn't proved viable." All Saturday services to Westport ceased by July 1991. From the 21st of May 1991 the familiar Air Nelson livery was replaced and the aircraft were progressively repainted in the blue/teal/white colour scheme of the parent company and rebranded with Air New Zealand Link titles. In December 1995 Air New Zealand bought full ownership of Air Nelson. On the 8th of September 2002 Air Nelson's services to Westport ended. The final services from Wellington to Westport (Airlink 791) and return (Airlink 792) were flown in Fairchild Metroliner ZK-NSJ under the command of Captain Neil Kenny and First Officer Chris Clarke. Eagle Air took over the Air New Zealand Link services to Westport the following days using Beech 1900Ds. A second airline has introduced flights to Nelson from Kapiti Coast Airport, adding another 13,000 seats in and out of the two centres each year. Sounds Air managing director Andrew Crawford announced on June 5 that the weekday and Sunday service would begin on June 15. The new schedule provides two incoming and outgo-ing services to each airport on weekdays, and a late afternoon return flight on Sundays. In February, the airline also launched a six day a week service between Paraparaumu and Blen-heim, which was "building slowly", Crawford said. The new service was aimed to take advantage of a gap in the market left by Air New Zealand's withdrawal from the Palmerston North to Nelson route in April this year. Air New Zealand canned their regional routes served by their 19-seat Beech 1900 fleet, starting late last year, after announcing they were costing about $1 million a month. Crawford said the newly introduced route was attractive as Sounds Air had spare fleet capacity, and was already flying to Kapiti Coast Airport. "Kapiti and Palmerston North are not as far apart as Kapiti and Wellington, so we thought it might appeal to the Palmerston North people. "It's better than setting up at a new airport [Palmerston North], with more staff and more rent." Competing Paraparaumu-based airline Air2there also offers a service between Paraparaumu, Nelson and Blenheim. However, Crawford said he was not concerned about the competition as all Sounds Air flights between Nelson and Paraparaumu were direct, which he believed would give them an advantage. The airline would use a 12-seater Cessna Caravan from its existing fleet for the Paraparaumu to Nelson service. Kapiti had strong population growth, and about 150,000 people lived within 30 minutes drive of Kapiti Coast Airport, Crawford said. The Sounds Air Blenheim and Paraparaumu route also attracted a good proportion of customers from further outside that area, and it was expected the new ser-vice would too. "People can go for the day and back, and it works well for the weekends with the Sunday service." Air/There chief executive Richard Baldwin said the Paraparaumu to Nelson route had been operated by their company for 11 years, and some direct flights were offered. Eurocopter EC 130 ZK-IVJ called in for a quick refuel before heading east. As I arrived at Taupo on 2 June 2015 Eagle Air's Beech 1900 ZK-EAH was departing for Auckland. Taupo's Floatplane's Cessna 206 ZK-EFI was at the airport while the sister aircraft ZK-FPO was on the lake. Sounds Air's Taupo flights take off!